Association manager in many companies is hired to manage the day to day activities. These are the individuals who provide the management services to the company where they work. The main job roles of association managers are database management, recruitment management, bookkeeping and a lot more. An association manager has great organizational skills along with marketing and administration abilities. When you want to switch to another job, writing a resignation letter is the trickiest part. It is one of your responsibilities as an employee to let your employer know about your decision of leaving the job. The reason for leaving the job should also be explained to the employer. This gives enough time to the employer to find an appropriate replacement. The resignation letter content also depends on the circumstances in which you have decided to leave. Sometimes, it is not suitable to provide the reason for leaving. 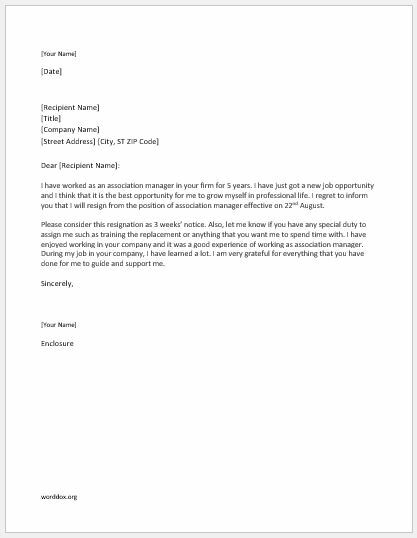 Depending on why you want to quit the job, you can draft the letter differently. Make sure that you the resignation letter is short and to the point. I have worked as an association manager in your firm for 5 years. I have just got a new job opportunity and I think that it is the best opportunity for me to grow myself in professional life. I regret to inform you that I will resign from the position of association manager effective on 22nd August. Please consider this resignation as 3 weeks’ notice. Also, let me know if you have any special duty to assign me such as training the replacement or anything that you want me to spend time with. I have enjoyed working in your company and it was a good experience of working as association manager. During my job in your company, I have learned a lot. I am very grateful for everything that you have done for me to guide and support me.